The Highland Youth City Council is a great opportunity for youth to serve their community. 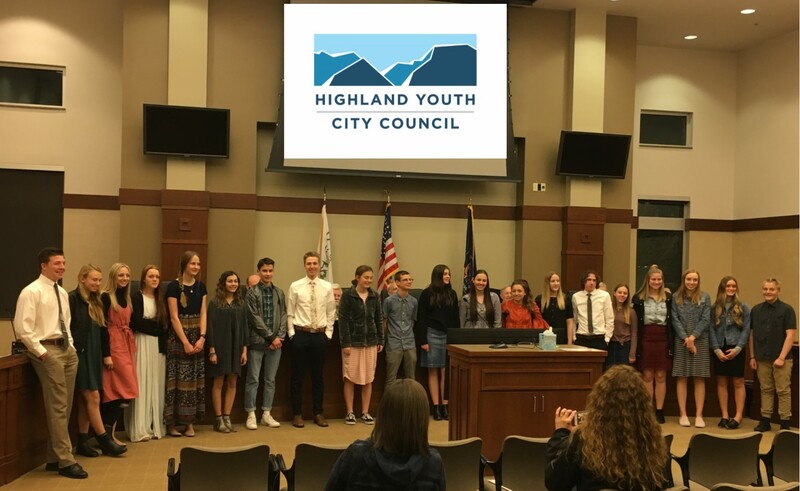 The Highland Youth City Council (HYCC) provides opportunities for leadership, community events, community service, and governmental learning. Applicants must live in Highland City and be in grades 9-12. HYCC is not limited, but is asked to make a time commitment. HYCC members will serve a term of 12 months from January - December with the exception of those in their senior year of high school who will serve 6 months from January - June. Members are put into committees for their service. They must commit to being involved in 1 or more of the following committees: Events, Service, Government, Marketing, Attendance. Some of the activities the Youth Council participates in include: Leadership Retreats, Legislative Day, Easter Egg Hunt, Arbor Day Tree Planting, Highland Open House, Highland Fling, Service Projects, Senior Citizens Appreciation Dinner, and Christmas Crafts Day. Application information for 2019 Youth Council is due on December 3, 2018 and Nov 20(Extended from Oct 29), 2018 for Leadership Group. The Application is found HERE. More information about the roles in the Leadership Group can be found HERE. After the yearly deadline, applications will continue to be accepted for a waiting list. When vacancies arise they will be filled from the waiting list. The Highland City Staff Advisor for HYCC is Julie Tapusoa. City Council Advisor is Tim Irwin.